Hey longtime WUP readers, welcome back to a very special edition of “Know Your Asians“! For newer readers, check it out and enjoy! You might not be familiar with Thai pro golfer Kiradech Aphibarnrat, but you really should get to know him. Why? That’s easy — because he’s awesome, humble, introspective and an all-around good guy. During the week of the Open Championship, we had the chance to catch up with Kiradech at his rental home in Hoylake. Playing in the final three-ball on Friday afternoon, Shiv Kapur is golfing his face off and he has nine holes to play, but he’s your current first-round leader at the Open Championship . While just about everyone else playing in the afternoon wave at Muirfield is scrambling for pars — and breaking clubs, Kapur fired a sizzling six-under 30 on the front nine, birdieing six of the first seven holes. He even had an impressive up-and-down on no. 8, which Ian Poulter called “a joke” on Twitter. Be generous. Future billions lie East. With the most intriguing golf tournament ever in the history of Asia underway, it’s hard to look too far past the tight race for No. 1 and the action at Shenshan International, but some of the games biggest names believe China has the potential to yield more than just land for the growing upper class. The Palm Beach Post’s Edgar Thompson reports that Jack Nicklaus and Greg Norman, who (among other Westerners), both have offices and multiple ongoing projects in China, predict the men’s golf world order to sound a lot more similar to the women’s rankings in the foreseeable future. My mom always told me that speaking Chinese would be a valuable skill to have. At least once a month, she’ll suggest I move to Shanghai for a year to hone my now very rusty Mandarin Chinese. “Speak to me in Chinese,” she often says to me while we talk on the phone. “You need to practice.” Yeah, yeah, a minute later, I revert back to Chinglish. Well, she’ll be happy to hear me say that she was right (as moms usually are), and oddly, being able to speak Mandarin was somewhat useful at the PGA Championship on Saturday. There’s an influx of Asians on the LPGA. And they’re really good. In fact, they win a lot. But many fans find it difficult to keep track of who is who because, you know, all Asians look alike and their names sound the same. So, let’s get to know them better. Looks like Amy Yang is going to lose to Angela Stanford, who is 2-up with four to play in the semifinals of the Sybase Match Play Championship, but let’s get to know Amy better, anyway. Who knows, she could hit the shots of her life in those closing holes. Either way, she’s proved to be a force to be reckoned with. *Update: Winning two of the final four holes, Amy forced the match to playoff and lost in the first extra hole to Stanford. I couldn’t see very well, but I believe she missed a relatively short par putt. Born in South Korea, she moved to Australia at age 15 to pursue golf more seriously. As an amateur in 2006, she won the Ladies European Tour’s ANZ Ladies Masters, becoming the youngest winner ever on the LET at 16 years, 192 days. The LET granted her a special three-year membership exemption as a 17-year-old. In 2007 she placed in the top-20 four times while still attending high school. Amy claimed her second LET win with a four-shot win at the Ladies German Open in June 2008. When she accepted the trophy, she announced that she was donating her entire prize of $61,260 to victims of a recent earthquake in China. At LPGA Q-School in December 2008, she placed second to earn full playing status for the 2009 season. Amy lives with her father, Joon Mo (James), mother, Sun Hee (Sunny), and younger brother, Steven, in Orlando, FL. The 30th seeded Yang beat Michele Redman, Juli Inkster, Morgan Pressel and Haeji Kang to reach the semifinals. After beating Kang in the quarterfinals, she told the Golf Channel that match play makes her nervous. Interestingly enough, she also said she’s been playing conservatively, rather than aggressively (the typical match play strategy), to put pressure on her opponent by staying in the match for every hole. Obviously, this rarely-practiced strategy worked for most of the week — until she cowered (kinda) at Angela Stanford’s aggressive game. 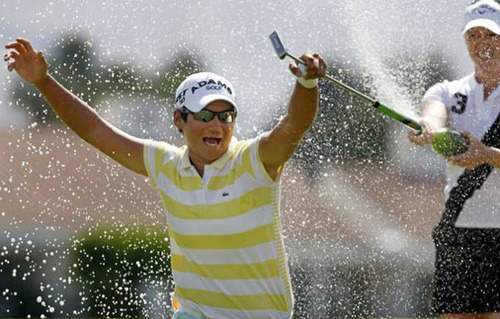 Because everyone loves a winner, Yani Tseng is this week’s featured Asian. She won the the LPGA’s first major of the season, the Kraft Nabisco Championship, by one stroke over Suzann Pettersen on Sunday. Amidst a star-studded leaderboard that also included Lorena Ochoa, Jiyai Shin and Cristie Kerr, Tseng fired a four-day total of 13-under to capture her career second major victory. If you know anything at all about Yani, you know it’s impossible not to love her. Born in Taiwan, she’s 21 years old. Her English fluency? Pretty good — she gives interviews and press conferences interpreter-free. She even tweets! She has a great sense of humor, making fun jokes on this past Sunday’s pre-game show. She enjoys working out, playing Ping-Pong, and is an avid billiards player (I’ve also heard she’s a badass dancer). After a successful amateur career (four big amateur wins, including the 2004 US Women’s Amateur Public Links Championship where she beat defending champion Michelle Wie), she turned professional in 2007. Finishing sixth at LPGA Q-school, she earned her card for 2008. During her rookie year, she captured her first LPGA victory in June 2008 at the LPGA Championship and became the first player from Taiwan to win a major championship. On March 29, 2009, she became the fastest player in LPGA history to reach $2 million in career earnings in a span of one year, one month and thirteen days. She hits the ball a mile, averaging 262 yards off the tee this season. Before the third round of the Kraft Nabisco, she called friend and playing partner Suzann Pettersen to suggest they wear matching outfits — purple shirts and white shorts. Yani lives in Lake Nona Golf & Country club in Orlando, Florida, in a house previously owned by her idol, Annika Sorenstam, who paid her a visit in January for a pep talk. One of her goals off the course is to learn how to swim in her new pool. The LPGA kicked off its first tournament on US soil this week with the KIA Classic at La Costa Resort & Spa. After two rounds, you’ll never believe this, but there are seven Korean players in the top-10. (Shocking, I know!) In the spirit of “Know Your Asians,” I thought I’d feature the 36-hole leader, Hee Kyung Seo, who carded seven-under to hold a one-stroke advantage over fellow countrywoman In-Kyung Kim. Pardon my ignorance, but I’d never heard of Seo until this week. (Chances are that most of you hadn’t either.) And you’ll never believe this either, but there’s not a ton about her online, so thank you to Seoul Sisters for the background info. Born in South Korea, she’s 23 years old. Nickname: Supermodel of the Fairways (I can see how she got that one judging from the pic above!). Her English fluency? She’s still learning. She joined the KLPGA in 2006 and is currently still a full-time player on that tour. After the 2007 season, she practiced with LPGA star Jiyai Shin, who inspired Seo to work harder on her short game. In 2008 she won three KLPGA tournaments in a row, a feat few have achieved. At the KLPGA Awards Show in both 2008 and 2009, she took the stage with other KLPGA players to perform a dance number (she’s multi-talented!). Seo won three out of four KLPGA majors and placed second in the other during the 2009 season. In five starts on the LPGA last year, her best finishes were T15 at both the Kolon-Hana Bank Championship and SBS Open. She hopes she can win on the LPGA so she can get her card. Born in Kumamoto Prefecture, Japan, she’s 23 years old. She started playing golf at age 9. She turned professional in 2005, and in 2007 she became the youngest player in the history of the JLPGA to finish first on the money list. 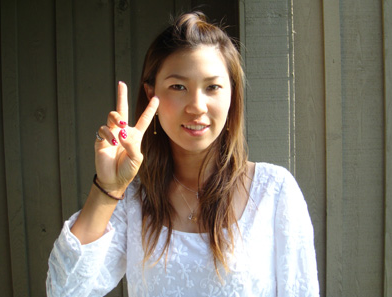 After winning the LPGA Mizuno Classic in November 2007, she became the first Japanese player to win an LPGA event in nine years and secured her LPGA tour card. This season she’s placed T6 at the Honda PTT LPGA Thailand and T15 at the HSBC Women’s Champions. She has a very bright website. Her name means “Peach” in Japanese. If she wasn’t playing golf, she would be a fashion designer, and sponsored by Pearly Gates, she dresses very stylishly (even when she’s playing ping pong!). If she could be anyone for a day, she would be Victoria Beckham so she could be married to David Beckham. She enjoys music, shopping, karaoke, pool, collecting earrings, soccer and swimming. Her favorite colors are navy blue, pink and white. She keeps a blog, but unfortunately for us English-speaking people, it’s in Japanese (but I’m told she speaks so-so English). She appears to have a very comfortable bed, too. Born in South Korea, she’s 22 years old. After winning the Hite Cup on the KLPGA, she turned professional in 2004. In 2005 she won three KLPGA tournaments and was named KLPGA Rookie of the Year. She placed third at LPGA Q-school in 2007 to earn her 2008 tour card. In 2009 she had six top-10 finishes, including runner-up twice. She enjoys shopping and fishing. She listens to pop music; her favorite is Korean pop. For more info, check out Pure Golf Training’s Korean Golf Secrets.